Hello Loveys!!! 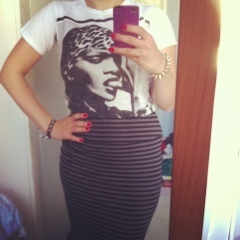 Heres an OOTD where I am rocking my Rihanna t-shirt! Teamed with a stripey pencil midi skirt from River Island this outfit rocks it! I added a studded bracelet, and with my high black heels and leather jacket I reckon I will be repeating this combo again!